BuildTak, GeckoTek, ZebraPlate, FabLam, what are the cool kids using? I'm thinking about trying some build surfaces. There are a lot of them out there, and they're not cheap enough to just order a bunch, so I was curious what others have had good luck with. Mind sharing? I've tried a bunch and always come back to PEI. I tried Build Tak at one point, while it certainly works, it's far too easy to destroy the sheets, if you're first layer is marginally low, you'l endup tearing the surface when you remove the print. To this point PEI is my preference as well. It really depends on what filament you're printing with and what your aesthetic preference is. If you are printing PLA or ABS and don't care about a textured first layer, then BuildTak, Fablam and PEI are all excellent. If you are printing PLA or ABS and want a glossy or nice matte first layer, PEI is the bees knees. 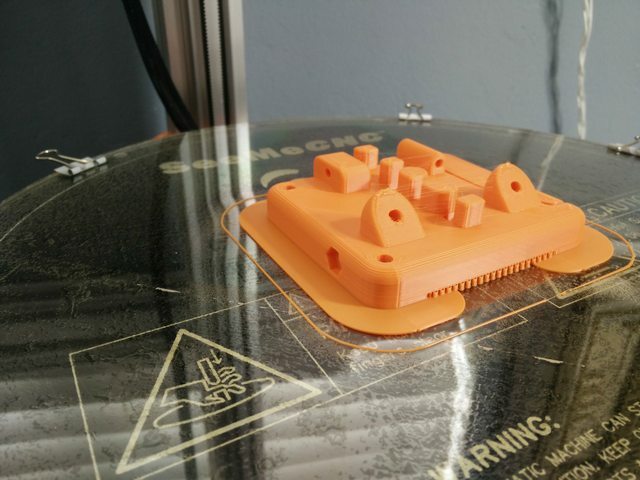 It you are printing PLA or ABS and want to get several 1000 prints out of your build surface (or more) without it ripping, gouging, etc, then PEI is the bees knees. The only one in that list I haven't personally tried is GeckoTek. After hearing all the cool kids rave about PEI, I finally took the plunge and ordered at 12" kit through amazon. I literally just installed it this morning, and after getting z-height figured out, I'm running my first print on it. So far it seems to be a bit picky about first layer height, so I kept lowering it by 25 microns until I was seeing good first layer adhesion on a sample print. I've been using PVA gluesticks + ABS Slurry for years now, and I'm hoping that I'll see similar or better results from PEI. gestalt73 wrote: After hearing all the cool kids rave about PEI, I finally took the plunge and ordered at 12" kit through amazon. You might want to give that new factory finish a good cleaning with isopropyl alcohol and and good rub down with a clean cloth. Sometimes a new surface needs "breaking in". If you are using the matte finished side then a little love with some 600 grit wet & dry sand paper works wonders. For $21, I guess I'll give PEI a try. That's a great deal for a precut AND 3M adhesive! I'm picking up a couple myself. As another option - PLA prints very nicely on bare glass at 55°C. It leaves a super shiny finish though. mhackney wrote: That's a great deal for a precut AND 3M adhesive! I'm picking up a couple myself. I thought it seemed a little too good to be true, as well. I've had a slab of PEI sitting around for a couple months (it's literally a 1/4" thick chunk of it) and after discovering that I couldn't lasercut it into a circle, I kind of forgot about it... For the price though, I'll be giving the GizmoDorks product a try on Thursday (love Amazon). Yeah, mine are coming on Thursday too. Just in time to put on a new D300VS delta I just completed yesterday. Thing is a mammoth! Aw man! I didn't see the round ones! The 12" square ones were easy to cut down into shape after installation, Ima gonna order a few more round ones for the other machines. My first print is about 3/4 done, 11mm high so far, and it appears to be holding much, much better than pva gluestick + abs slurry I've been using. I'm not seeing any of the curling that I just saw on my last print of the same model. Jimustanguitar wrote: For $21, I guess I'll give PEI a try. I like the ones I get from CS Hyde Company. You can order whatever size you want. I get them 12.25", that way it's not such a pain to center. Once it's set, run a new razor around the outside edge. 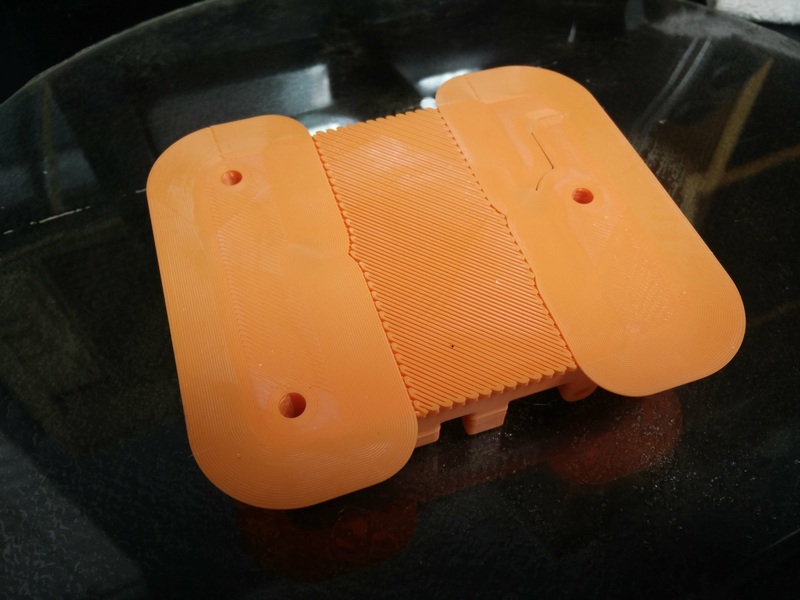 Orange ABS printed at 260c first layer / 250c layers after on a 90c build plate. I'm thinking I should have done a better job of squeezing out little air bubbles between applying the adhesive and the pei sheet. After removing the first print, there were a few spots where the pei lifted a bit and consolidated the air underneath. I just used a fine needle through the PEI to then press the air out. not sure how that is going to work after the next print, but it's nice and flat now. gestalt73 wrote: Well, all I can say is WOW! The trick I use is a few drops dishwashing soap in warm warm, spray the glass and the PEI sheet, use a small squeegee to push the excess water and air out. The water give you time to position and get the air out. Interesting... Do you do that when you set the adhesive sheet to the glass, then again between the adhesive and the pei sheet? No you spray the adhesive side and the glass before putting them together. Ok, I think I get it. 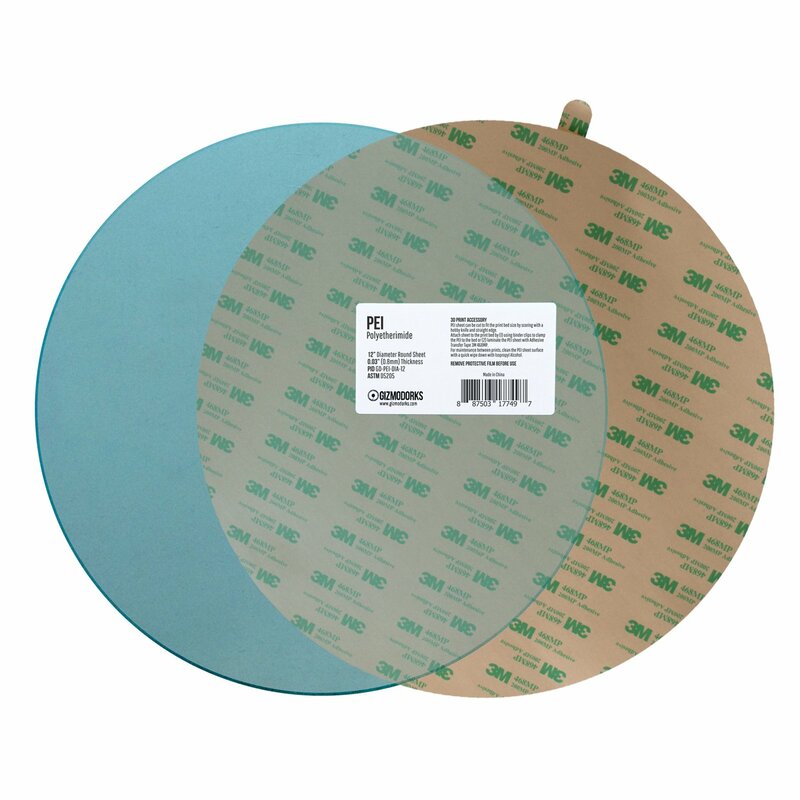 These kits have an adhesive layer and pei layer that's applied separately. On my next one I'm going to try it. Thanks for the tip! Read my looooong thread on PEI - it has a lot of info on the 3M adhesive and various techniques to apply it. I don't understand you guys, the place I've linked several times is 1/2 the price, adhesive already on it (yes 3M) and you can get it cut within reason the size you want. TwoTone wrote: I don't understand you guys, the place I've linked several times is 1/2 the price, adhesive already on it (yes 3M) and you can get it cut within reason the size you want. Those will fit the RostockMax build plates exactly. I'm going to order a couple. I also see they'll do custom sizes. I'll most likely be ordering a couple for my 400mm superkossel build. 5 mil. That is going to be prone to tearing and any bubbles when applying will telegraph through to the surface. I experimented with various thicknesses 3 years ago and 30 to 40 mil is the best bang for the buck, lasts for years and doesn't telegraph adhesive bubbles. That's 3mil - .003". Barely thicker than the diameter of a hair. Caveat emptor. The dish soap and water "slip" sounds a lot like the application fluid that window tint and vinyl graphic installers will use. Whether it's a slippery concoction or a mild solvent for the adhesive, it lets you slide the pieces around until you've got them positioned the way you want them, and then you squeegee out the air bubbles to set it. It's "the" way to apply something like this without any air bubbles. Granted, it takes a bit of practice, and it's not easy with the PEI sheet being semi-rigid, but it still ought to work.